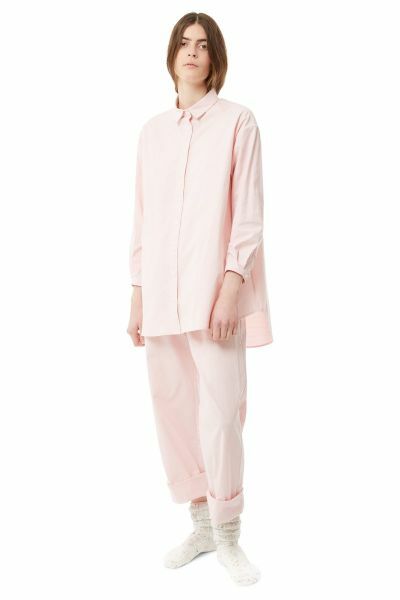 Made from a crisp and sturdy pink gingham seersucker a simple, oversized shirt which is perfectly designed for sleeping, lounging, wearing by day and by night and generally being your favourite thing to put on. The Simple Shirt in pink and white seersucker gingham is a Cabbages & Roses staple from season to season. The shape has been taken from a traditional Oxford shirt. Cabbages & Roses engraved buttons fasten down the centre front. A simple curved hem falls to upper thigh and even lower at the back. This shirt has been made slightly oversized, as no one likes to sleep in straight jacket. We also like to wear him with jeans on lazy days. The Simple Shirt is made from a sweet seersucker pink & white gingham cotton blend woven in Italy. He was made in Hertfordshire. 100% cotton. Caring for your Top: Can be machine washed at 30°, we recommend using Ecover Delicate Laundry Liquid. Can be dry cleaned, if you must with an ecologically friendly dry cleaner. Press with a cool iron. Please do not bleach or tumble dry.